Unpaid invoices – CCJ or debt collection? When you’ve tried every other way to collect your money, sometimes the only option left is to go legal. Don’t worry about upsetting your customer because if things have got to this stage, ask yourself if they are type of customer you want to work with? CCJ Vs Debt Collection – Which is right for you? The whole County Court Small Claims process has been updated and is now online. Here you can submit a claim at UK Gov Money Claim Online. Before you begin, make sure you can prove the customer owes you money and you have all the detail needed to complete the form. Remember, you’ll need to pay the court fees up front too. Also, this is an automated system so once you have completed the 8 steps, you cannot cancel. Read the User Guide for Claimants and learn how to prepare you claim. If there’s anything you’re not sure about, it’s best to seek legal advice. If it’s got to this stage and you prefer to let someone deal with chasing the debt, be aware the debt collection agency will charge you handling and commission fees which vary at each stage of the process. Some agencies work on a no-win, no-fee basis, some charge commission on money recovered and a fee for handling various stages, for example. Chasing Letter: The idea of a chasing letter is to try to resolve matters without going to court. However, under the new guidelines (October 2017) all Letters Before Action (LBAs) must contain all detail about the debt, a statement of account and any interest charges applied. Like Late Payment of Commercial Debt. By law, the recipient must be given 30 days to respond to this letter. Debt recovery with legal action: If the agency issues legal proceedings on your behalf, find out how far they will take the process. There will be a fee to pay if they to take your case to court and you will also have to pay the court fees and costs. The agency can serve legal documents to the debtor on your behalf. If you’re thinking about going to a debt collection agency, have a look at the Credit Services Association’s member database which lists all debt collection and debt purchase companies. You can ask your solicitor to write a letter which will often do the trick because the words “legal action” seem to make people want to pay up. You must have evidence, including the terms and conditions your customer agreed to. If you can’t produce these, it’s going to be very difficult, if not impossible, to bring a claim. You’ll need to show which invoices are unpaid, when they were sent and all the correspondence you’ve had so far about the debt. If you’re thinking about bringing a claim, watch out for the fees because if your customer disputes the debt, fees and costs mount up and you end up paying out more money than you’re owed. Okay, you didn’t get paid but at least you are doing something about it. Remember, this dispute isn’t personal, it’s business. You provided goods or services for which you haven’t been paid. They agreed to pay you by a certain date and they didn’t. Your contract with your customer and cash flow are directly connected. Bespoke terms and conditions, written for a specific product, service or event will protect you and your business and make sure you get paid on time. 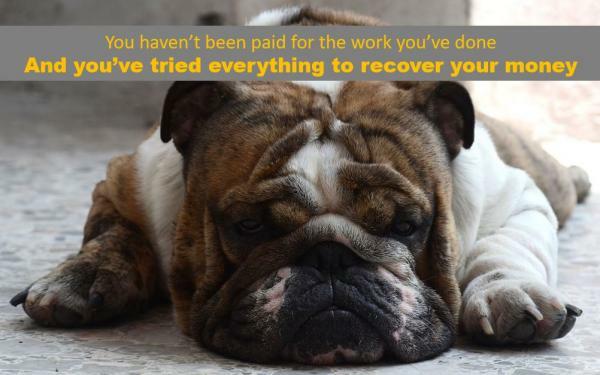 Before you think about using a debt collection agency, talk to me. I can review your contracts, processes, terms and conditions and show you alternative techniques to get paid on time, every time.